No doubt in that, Windows is the most widely used Computer operating system. But, we can’t deny that, In Windows more errors comes in comparison of Mac OS. Though, In latest version of Windows 10, Microsoft has added a troubleshoot section. Which helps you to sort most of the Windows Errors including BSOD errors. But, sometimes instead of solving problems. Troubleshooter just tell you the cause behind the problem. Like, you’re getting “Ethernet Doesn’t Have a Valid IP Configuration”. 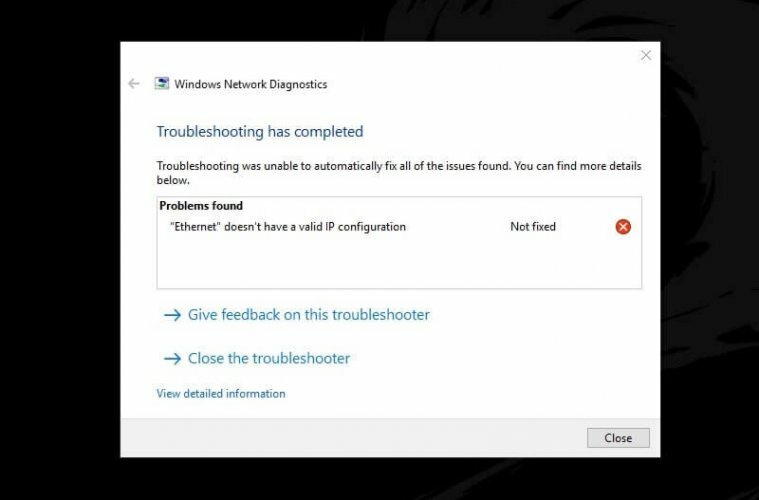 If Windows Network Diagnostics is showing this error. You don’t have to worry about it, you can fix this error by yourself. What is “Ethernet doesn’t have a valid IP configuration” error?. Internet Protocol is known as IP address. 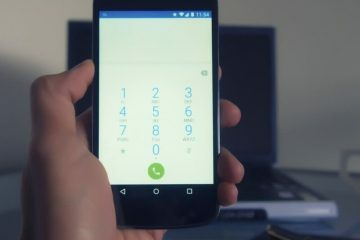 It is assigned to each devices connected to Computer Network that uses the internet protocol for communication. IP address serve two functions. One is location addressing and another is network interface identification. And, there is two IP version IPv4 and IPv6. If a device is unable to get a valid IP address. Then, it will not work. And, “Ethernet” doesn’t have valid IP address error occurs. When your Network Interface Card (NIC), that is connected to router/modem through Ethernet doesn’t get a valid IP address. In Computer Network, DHCP assign IP address and other network parameter to each network devices. So that, devices can communicate. Dynamic Host Configuration Protocol is known as DHCP. So basically, your Ethernet connection is unable to get a valid IP address from DHCP server. And, that’s why, you are getting this error. And, you’re also able to see a yellow exclamation mark on Network Icon. There could be couple of reason behind this error. Like, Faulty NIC Card and Router and incorrectly assigned IP address. But, Whatever is the reason, here are some working solutions to fix this Error. Please try each solution, and, if problem not get resolved after trying all solutions. Then, feel free to Comment. 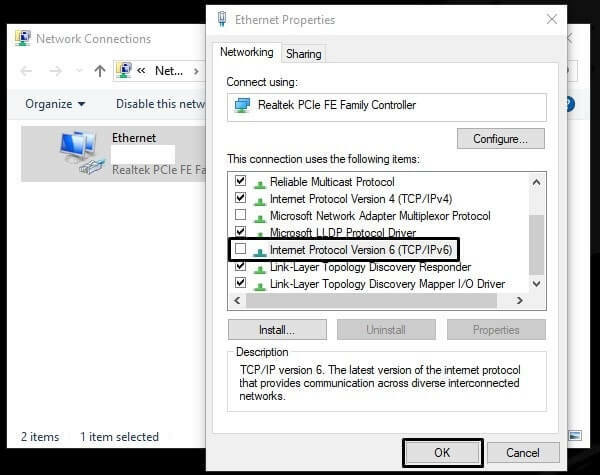 1 Solutions – Windows 10 Ethernet Doesn’t Have a Valid IP Configuration. 1.1 1. Install LAN Driver. 1.2 2. Check Network Hardware. 1.3 3. Reboot / Reset Router. 1.4 4. Disable Fast Startup. 1.5 5. Use Dynamic IP Address. 1.7 7. Reset & Renew TCP/IP. 1.8 8. Disable and Enable Network Adapter. 1.10 10. 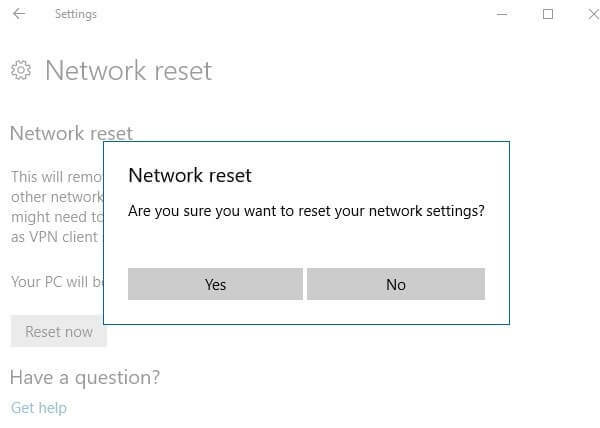 Reset Network Settings. 1.11 11. Connect Modem Directly. 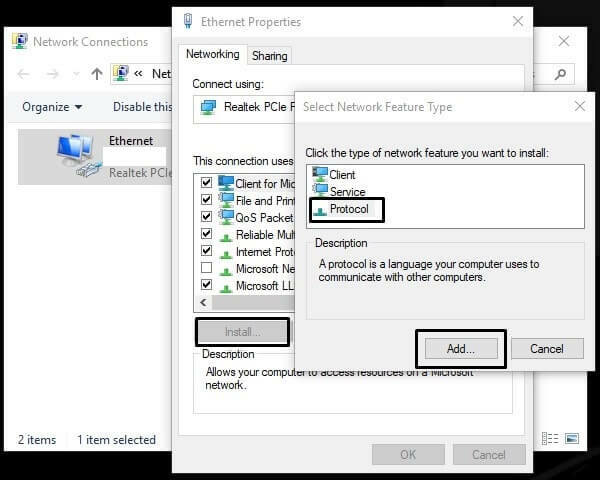 Solutions – Windows 10 Ethernet Doesn’t Have a Valid IP Configuration. Note: When this error occurs, Ethernet shows ‘identifying’ and ‘unidentified network’ error. And, I have already written a solution guide on “Unidentified Network Ethernet” error. So, please read that article to get to know about some more solutions. I had face same issue after reinstalling Windows 10. And, I was able to solve this error by installing LAN Driver. 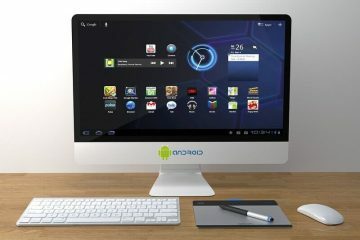 Driver software helps devices to communicate with operating system. And, if outdated NIC/LAN driver is installed. Then, this error occur. There are four ways to update the LAN Driver. 1.1 Check for Windows Update – When you install new Windows. Microsoft ask you to update some required driver software. So, it could possible that LAN driver update is available. Open Settings App and go to “Update & Security”. Click on “Check for Updates”. 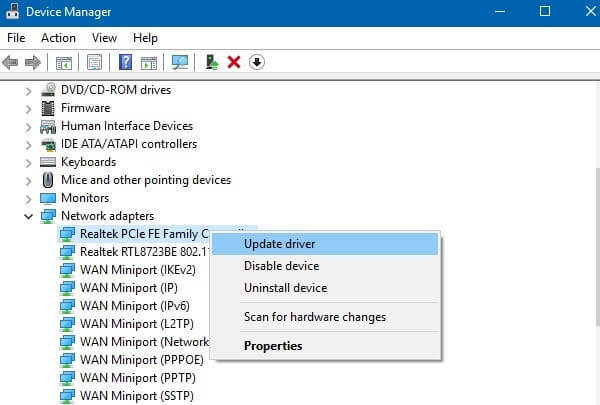 1.2 Device Manager – You can update any Computer Driver using Device Manager. And, if you have build a Computer. Then, this is the best way to update. Press Windows + X key and from the menu click on Device Manager. In Device Manager, Expand Network Adapters. And, then right click on LAN Driver and click on “update driver” option. 1.3 Install Driver Manually (This is what I did.) – If device manager is telling you that, update isn’t available. Then, if you’re using laptop then visit driver download page of it. Select your laptop model and download LAN Driver. After installing driver. You have to reconnect Ethernet Cable once to fix this Error. Or, if you have built a Computer, and added NIC Card. Then, visit NIC card manufacturer site for driver software. Also, check for network card box for driver CD. 1.4 Use Driver Updater Software – If Device Manager doesn’t work. And also, you’re unable to find out driver software update. Then, with the help of some premium device manager software you can update outdated or missing LAN driver. That’s it. All you have to do is update LAN Driver and reconnect Ethernet Cable. And, Error will get resolved immediately. But, if the “Ethernet Doesn’t Have a Valid IP Configuration” error is not from driver side, then, you can try all other solutions mentioned in this article. Faulty LAN Cable or Modem / Router can create conflicts. If driver software is properly installed. It could possible that problem is with hardware. Connect on another system – If you have another Computer or Smart TV. Then, connect LAN Cable to it. And, check internet is working or not. Try Another LAN Cable – If you have extra LAN Cable, then try changing it. Maybe your cable got damaged. Check for loose ends. – Make sure all wires are connected properly. 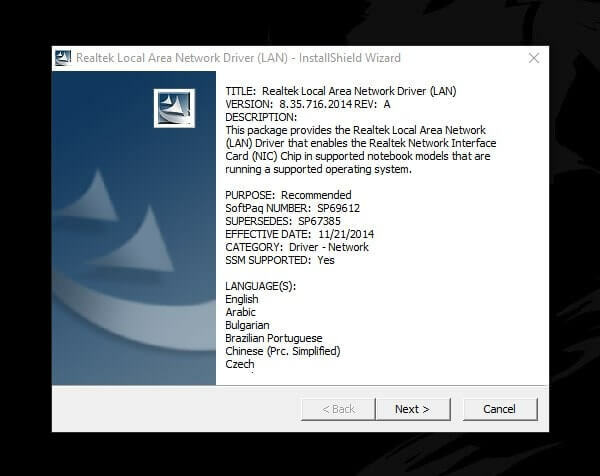 Reconnect Network Card – If problem is with desktop Computer. Then, Open CPU and reconnect network card. Modem and Router LED indicators – Check that all modem and router lights are showing properly. This error is related to Ethernet. So do check, Ethernet LED indicator gets turn on or not, When you connect Cable. Also, DSL light should turned ON. If it’s blinking even after 5 minutes on modem start. Then, contact the Internet Service Provider (ISP). 3. Reboot / Reset Router. Sometimes small solutions makes big difference. So, instead of start trying some complicated solution. Try rebooting your Router and Modem. Because, if your internet was working before. And, suddenly problem occurs. Then, you can fix “Ethernet Doesn’t Have a Valid IP Configuration” error with simple reboot. 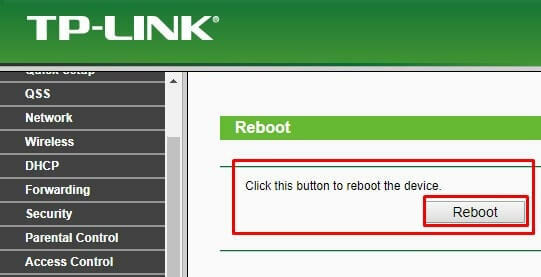 There are few ways to reboot a Router. 3.1. Use Power Key – Router and Modem both comes with a power key. Which you can find out behind it. Press Power Key turn off Router and Modem. And, wait alt-least 1 minute to turn it back ON. It will ask you for the login details. 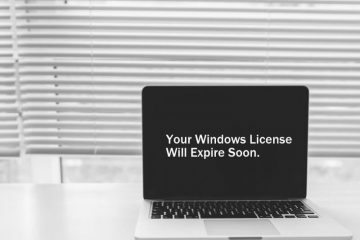 Have you recently installed Windows, or updated?. Because, Fast Startup (or, fast boot in Windows 8) feature comes enabled by default, when you perform clean installation. This feature save OS state to a hibernation file. And, help you to boot your Computer Faster. Though, this feature is quite useful to save few seconds while booting Windows. But, there are some downside of this feature. Which you might don’t know. And, fast startup is also one of the reason behind this Ethernet Issue. 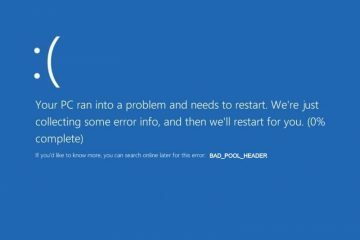 Many Windows users solved the error, by disabling fast startup. So, I suggest you to try this solution to fix “Ethernet Doesn’t Have a Valid IP Configuration” error. 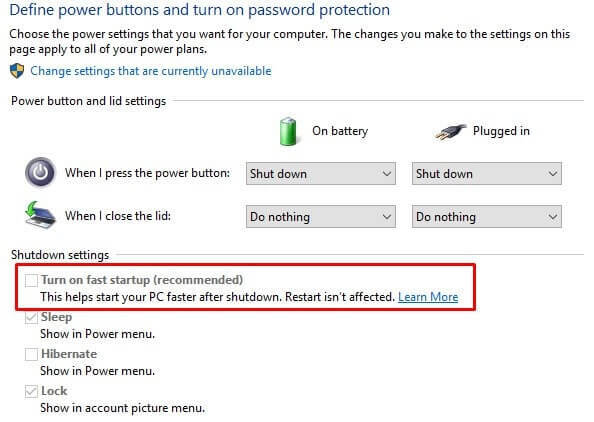 To Disable Fast Startup follow these instructions. Press Windows + X key simultaneously. And, from the menu, Click on “Power Options”. Click on “Choose what the power button does” option. After that, to access “fast startup” option. Click on “Change settings that are currently unavailable” option. That’s it. Now, you just have to unmark “Turn on fast startup” option. And, Click on save changes. After that, restart your Computer once. And, hopefully, error will get resolved. And, if error remains same. Then, Don’t forget to enable fast startup feature again. 5. Use Dynamic IP Address. Have you made changes in Ethernet IP settings?. Means, if you have added a static IP address manually. Then, you have to set it to Dynamic. So that Ethernet can obtain a valid IP address automatically. Click on “Network & Internet” option. After that, click on “Change Adapter Options”. Now, you will able to see all available internet connection. But, we have to make changes only in Ethernet Settings. Right Click on “Ethernet” connection, and then choose properties. In Ethernet Properties Window, Select “Internet Protocol Version 4” and click on properties. 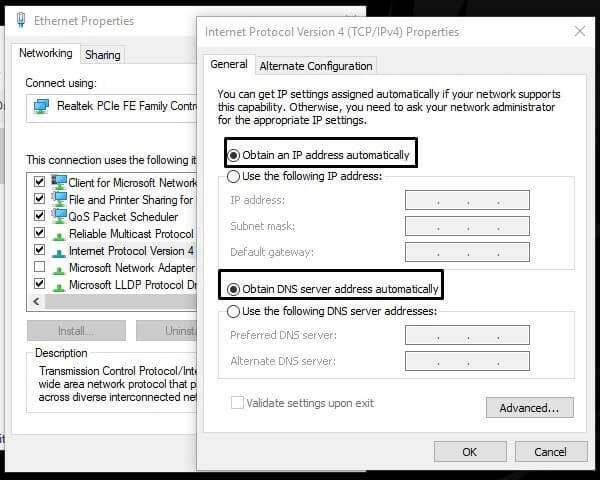 Select “Obtain IP address automatically” and “Obtain DNS server address automatically” radio button. And, click on OK.
Hopefully, now “Ethernet doesn’t have a valid IP configuration” problem will get resolved. As you know TCP/IP is an Internet Protocol Suite. That governs connection of Computer System to the internet. So, if due to some reasons, TCP/IP protocol got faulty. Then, by reinstalling it you can fix this error. 1. Right Click on network icon and click on “Open Network & Internet Settings”. 2. After that, click on “change adapter options”. 3. Right Click on Ethernet and then click on properties option. 4. Click on install button. In network feature type select “protocol”. Click on Add. 5. Now, from select network protocol window. Choose “Reliable Multicast Protocol” and click on OK to install. 6. After reinstalling TCP/IP. Restart your Computer and reconnect Ethernet Cable. 7. Reset & Renew TCP/IP. If you’re unable to reinstall TCP/IP. Then, you can reset it, by using some commands. The “Ethernet Doesn’t Have a Valid IP Configuration” error is related to IP. So this solution will definitely work. 1. Click on start button and search for CMD. Right Click on Command Prompt and then click on “Run as administrator”. 2. Now, type these following command one after one. And, press enter after each commands. 8. Disable and Enable Network Adapter. This solution is suggested by a Windows Forum. Though, for some users this solution got work. You can give it a try. 2. 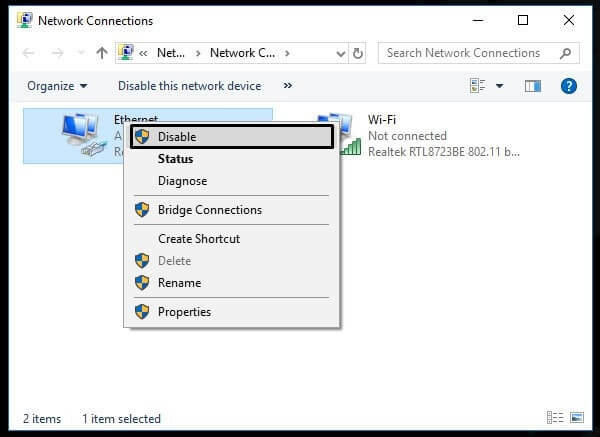 Right Click on Ethernet Connection, and, then click on Disable. 3. After 30 seconds, again, right click on it and then click on Enable. That’ it. hopefully, now your Computer is able to recognize your Ethernet Connection. And, “Ethernet Doesn’t Have a Valid IP Configuration” error will get resolved. As I mentioned, at the starting of this article. There are two internet protocol. In which IPv4 is old and IPv6 is new. For Ethernet Connection, IPv6 is not a compulsory internet protocol. So, it could possible that, IPv6 is creating conflict. That’s why, I suggest you to disable it. Press Windows + X key and from the menu click on “Network Connections”. After that, Click on “change adapter settings”. Right Click on Ethernet connection and click on properties. Scroll down a little, and then unmark “Internet Protocol Version 6”, and then click on OK.
That’s it. You have successfully disabled IPv6. Now, reconnect your Ethernet Cable. And, hopefully, “Ethernet doesn’t have a valid IP address” error will resolved. If you think due to some unwanted changes done by you. “Ethernet doesn’t have a valid ip configuration” error occurred. Then, you can reset network settings. Scroll down click on “network reset”. Click on “reset now”. And to confirm, click on “Yes”. Have you connected modem with a WiFi router. To use the modem as a Wireless Connection. Then, instead of connecting Ethernet cable to router. Connect it directly to the modem. Also, if Ethernet connection is making problems. And, you don’t have a wireless modem. Then, buy a router and use your internet without Ethernet cable. That’s it. these are the only working solutions to fix this error. Though, by installing right driver you can fix this error. But, if driver software doesn’t make any change. Then, try each and every solution. 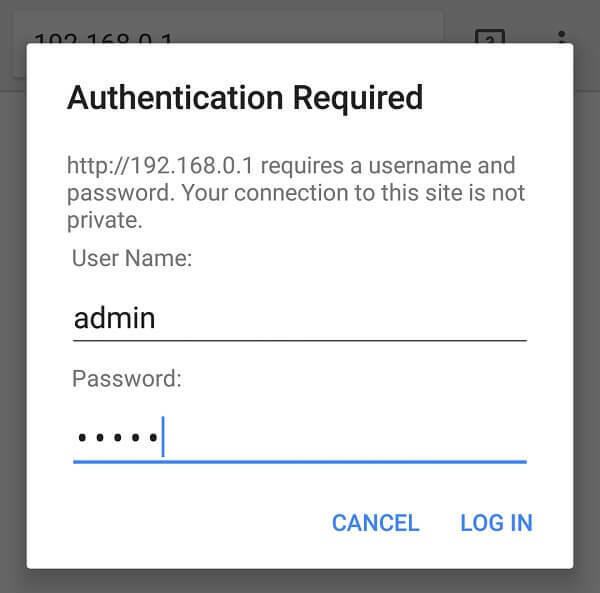 Previous ArticleFix Your Connection is Not Private Chrome – Privacy Error.